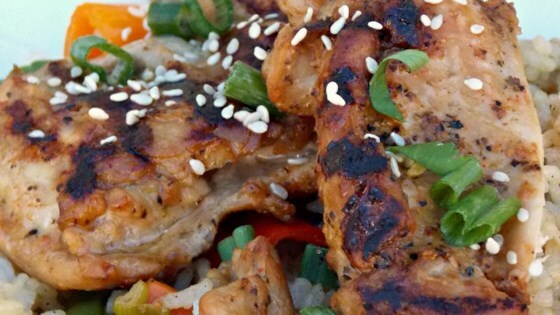 "If you like marinated teriyaki barbecue, you'll love this. Chicken thighs are marinated in a mixture of garlic, ginger, soy sauce and brown sugar. Goes well with macaroni or potato salad." Place chicken in a container large enough to hold it all. In a separate medium bowl, combine the garlic, ginger, soy sauce and brown sugar. Mix well and pour over the chicken. Seal container and let marinate in the refrigerator overnight. Preheat an outdoor grill for medium to low heat and lightly oil grate. Grill chicken over medium to low heat for 1 hour, turning halfway through cooking time. Chicken is done when it's juices run clear. Discover Chef John's great technique for making perfect barbecue chicken. I'm from Hawaii and this recipe will not work! There way too much soy sauce, the chicken will be too salty to eat. Don't waste your time or money making this chicken recipe. I reduced all the amounts signifantly. Who has ever heard of this much soy sauce going in a recipe? I dropped my soy sauce down to a mere three tablespoons and only did four thighs. this recipe is AMAZING, something my entire family loves. It's the perfect mix of salty/tangy!